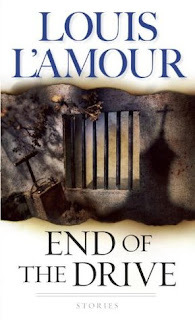 End of the Drive is the seventh book in The Sacketts series by Louis L'Amour. Available at Amazon, Barnes and Noble, and BooksAMillion. A veteran trail driver, who has survived thundering stampedes and Comanche raids, discovers there’s nothing so dangerous as courting a beautiful woman. . . . A brutally beaten homesteader crawls off to die—only to stumble upon an ancient talisman that restores his will to live. . . . This treasure trove of stories captures the grit, grandeur, and the glory of the men and women who wielded pistol and plow, Bible and branding iron to tame a wild country. A mysterious preacher rides into town to deliver a warning that leads to a surprising revelation. . . . And in the full-length novella Rustler Roundup, the hardworking citizens of a law-abiding town are pushed to the edge as rumors of rustlers in their midst threaten to turn neighbor against neighbor. Each of these unforgettable tales bears the master’s touch—comic twists, stark realism, crackling suspense—all the elements that have made Louis L’Amour an American legend. I'm a lover of short story collections though, to be fair, this is a collection of seven short stories and one novella. My biggest complaint is printing typos; a good editor should've caught them. L'Amour gets a lot of beef for using stereotypical ethnic tropes, particularly in regards to Native Americans, but I know there's a big difference between a Hollywood Indian and a real Native American and I expect other readers, with exception to the very young, to also know the difference. L'Amour played with the tools of the trade that were available to him. He wrote these books in a time when ethnicity wasn't emphasized (or sometimes erased) by the arts industry and L'Amour still found small ways to work in real information about Native Americans. For instance - Hollywood gave us the image of an Indian greeting -with no specification to tribe- by saying how and bobbing a hand over the mouth. In this book, L'Amour works in the correct way to use the Lakota greeting hau kola, "how kola," with no hand bobbing. His predecessors most certainly did not attempt this so L'Amour may have played a role in breaking those stereotypes within the arts community. He also preserves some of the atrocities that have been done to ethnic groups. You have only to read his books to see what Native Americans are talking about when they discuss persecution and I wish these books were more often utilized as a tool for that means.